Heat Set Crayon Art on Quilt? Thread: Heat Set Crayon Art on Quilt? Looks like fun and something I would like to try in the future! For those of you that have tried this, I would love to hear how you do it!! There is a beautiful tutorial on here for a bird. It is a wonderful art which I have the crayons for but it's not on top of bucket list yet, getting there. Enjoy the tute. I do this alot with my embroidery. I love to shade the center of my flowers and the petals before I actually start the embroidery. I shade the animals too. 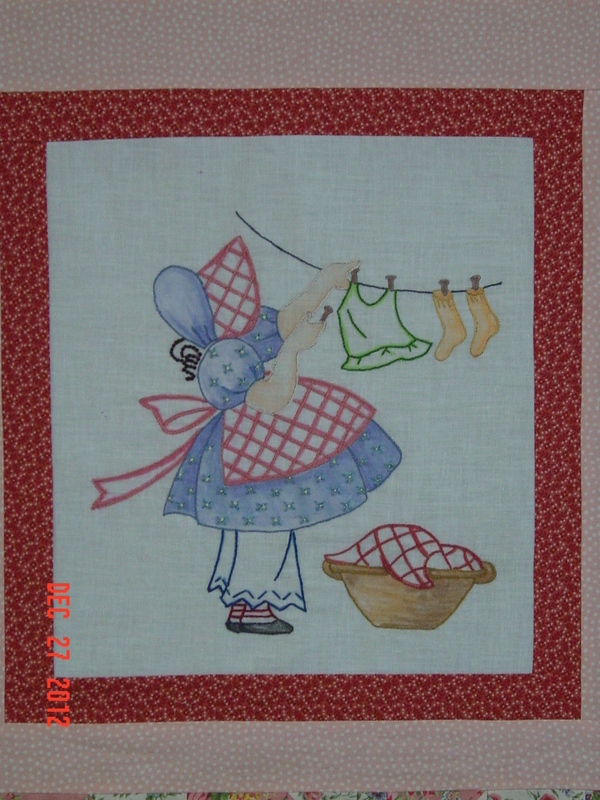 Did a quilt with Bunny's with pretty little dresses on, for my new GGD, and even added pink on there cheeks.This adds dimention to your embroidery. I trace my pattern on my back ground, use my crayons to shade whatever area I want shaded, lay a paper towel over it and heat set with iron. Be careful about changing your towel often, because there will be wax on it from the crayons. Then I start my stitching. This I do by hand. I love doing hand work, its so relaxing. We did this to decorate t-shirts with my daughter's Girl Scout troop using pictures from coloring books, and this is what we learned. When tracing your design or coloring, place your fabric on a sheet of fine grit sandpaper, which stabilizes the fabric. Use a Sharpie for nice crisp lines. Press down HARD with the crayons. Remember that the color will only be as intense as the amount of crayon that is on your fabric. You can use any type of wax-based crayons. You can use any kind of paper to absorb the wax, just make sure that whatever touches your fabric is plain (if you work in an office, copy paper that is clean on one side works great). Brown paper sacks and brown wrapping paper work well, too. Freezer paper does not. If you use newspaper, cover it with plain paper so the ink is not transferred to the fabric. PRESS, do not iron. And press until you are sure that all the wax has melted off, which may mean changing the paper underneath. Do not use steam. We did this with our Girl Scout troop when my daughter was in jr. high. It was a fun project and each girl participated by drawing her own section. I believe we used an old sheet to color on. I think we covered each side w/ white paper and newspaper as described in the link. I suggest you try one first to see if you get the sort of results you want. Crayola has a special set of crayons meant for iron setting. Kids at our church made a really cute quilt with the crayons. Like Jackie (above) I like to shade/color my hand embroidery. Set it using typing paper and wash as usual. The quilts don't get washed as much but my pillow cases do and they're still good to go. I just use the regular Crayola crayons from the 64 count box. It has more colors to choose from. I use Crayola crayons. The preferred fabric is a solid (like muslin) and I enforce it with freezer paper before coloring. If I want to blend colors I often start with a white crayon. When it is time to remove the wax, I remove the freezer paper and sandwich the piece between a brown grocery paper sack on the bottom and paper towels on the top. The wax will be removed but the color stays. If the color is not saturated enough, I go over it with more crayon and repeat. It is best to do any outlines before adding the wax or it will act like a resist and not accept the pen markers. It is also nice to add embroidery outline but that can be done after the coloring. If you use the special fabric crayons, you will color the picture on paper and iron the design off onto fabric. Just remember that your design will be mirrored. Either way works but the fabric crayons are so much more expensive. here is one of my favorite crayon pieces:This is so easy to do. I ironed a piece of freezer paper to the back of the muslin to stabilize the fabric. Using a light box or window, traced Sue onto the front of fabric with a fine point pigma pen or a lead pencil. The freezer paper is no problem to see your choice of motif through. After tracing, Do your coloring with any wax based crayon. Use a light touch to begin and add more color till you get the look you want and to get the shading. After the coloring is done, peel the freezer paper off the back, lay the coloring flat and put a layer of paper towels over it. Press the coloring until no more wax come s up onto the toweling. You have to change the paper towels a couple of times or more depending on how much wax crayon is in the fabric. When paper towels are clean you are ready to finish your project. I stem stitched around my girl after coloring her. It's very easy to simply draw on your fabric with the special crayons. Actually much easier than drawing on paper and transferring. And easy to blend colors that way too. Actually I had to resort to that method when working with kids, because I couldn't even make the moms understand about mirroring.